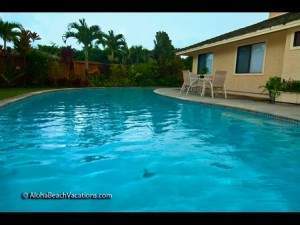 A great Kauai vacation rental in the heart of Hanalei! 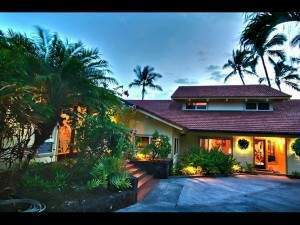 Amazing casual Hanalei home very conveniently located in Hanalei town. 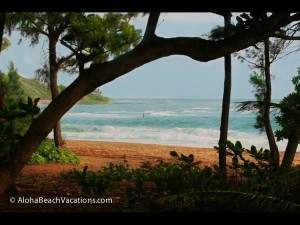 It’s a very easy walk to Hanalei Bay or town. Hanalei Bay continues to be rated as one of the best beaches in the US. 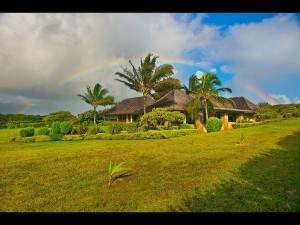 And it’s no surprise featuring its location; surrounded by the sheer natural beauty of the Pacific Ocean and the Bali Hai Mountains it is the most popular location on Kauai’s famed North Shore. Walk to Hanalei and easily drive to any other north shore beach; Lumahai, Ke’e, Tunnels, Hideaways, or Anini. Enjoy a taste of Kauai with the best location. A beautifully decorated 3 bedroom (all with their own bathroom) home in Hanalei is truly your own little slice of a tropical paradise. Once you enter the home the open living area sweeps past the kitchen and den to the large glass windows framing the lush tropical view in the backyard. A large daybed to relax after a day at the beach. The den is wrapped in windows and leads to the spacious lanai. The beautiful kitchen is newly updated and fully equipped. Hanalei Bay is unsurpassed as a vacation destination. Everything you could possibly dream of is here, beautiful beaches, surfing, shopping, dining, gentle rains and sunny days. Kauai’s North Shore offers many options for swimming, surfing, wind and kite surfing, snorkeling, and hiking, including the breathtaking Kalalau Trail. Hanalei is a cultural and historic treasure, with the best shops and restaurants in Kauai all within walking distance. Hanalei is a laid back surf town with the beautiful backdrop of the lush green mountains and multiple waterfalls, combined with the easy pace of the locals. And with nearly 2 miles of white sandy beach, Hanalei Bay is a favorite for many island guests and locals as well. Hanalei Bay is known for its crescent shaped beach and its landmark pier. Beach access is easy and parking plentiful. Hanalei Bay is a wonderful ocean playground to learn to surf, fish, watch sailboats, stand up paddle boarding, swimming and boogie board. Or rent a kayak and paddle down the Hanalei River for a scenic view. Enjoy a stroll through boutiques, surf shops, casual art galleries featuring local artisans, dine in quaint restaurants, or nosh on an island treat of shave ice. Rated as the #1 Beach in the US in 2009, World champion surfers and athletes call Hanalei home, Hollywood comes here to unwind. Come see why…you won’t be disappointed.